Bob KeefeWhen you were a teenager did you ever picture yourself playing guitar for a living? That's just what Lansing guitarist Bob Keefe has been doing since he was in High School. 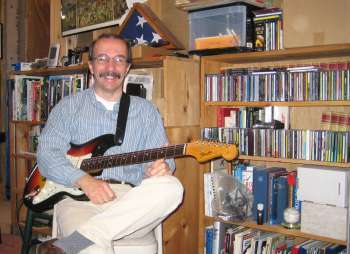 Keefe is a local performer and guitar teacher best known locally as guitarist in the Backtalk Band. He has also been spotted in the orchestra pit at Lansing school musicals. Keefe took up the guitar when a school friend did, and almost immediately began performing in a band. "I've been performing professionally since I was 15," he says. "My first job was a New Years Eve gig. My parents had to drive me to the job, because I didn't drive yet." He got jobs at DeMolay (a national high school service organization) events, High School dances, and Junior High dances. At that time, in 1964-1965, his band played surf music, The Beach Boys, Rolling Stones, The Turtles, Dylan, early Beatles. The band had two guitars, bass and drums. "We started as an instrumental group. Later on we developed our voices and started singing some of the songs." He still plays a lot of these songs, though his repertoire has expanded over the years. Keefe got his BA at California State Fresno, then went on to get his Masters and Doctorate in music composition from North Texas State University. He taught there while, then at the University of South Florida at Tampa, and Ithaca College, which brought him to the Ithaca area. As a college professor he taught electronic music, composition, music theory and music history. He isn't actively composing now, but took a commission by the Society for New Music about five years ago to write a piece of music that was recorded on a CD entitled "21st Century Masters." He has also performed on other artists' CDs. "When I became an academic I put the guitar aside," he recalls. "I still practiced, but didn't play out. I was concentrating more on composition, theory and teaching for four or five years." But Keefe wasn't happy teaching large classes and navigating college committees. He wanted to get back to performing and teaching on a more intimate level. He started taking performance jobs and guitar students in 1995. Currently he performs guitar and vocals with the Backtalk Band. 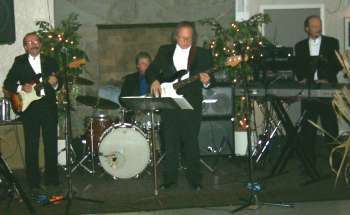 They play a wide variety of music, including Motown, Classic 50's & 60's Rock n' Roll, Rhythm and Blues, Jazz, and Swing. With regular gigs at The Boatyard Grill and Wagner Vineyards, they are often seen at other events and private parties, weddings and other events. The band also features Greg McQuade on keyboards, Jim Lawrence playing bass and Mark Joyce on drums. All four lend their voices to the mix. Keefe also plays jazz as a solo act, or with one or two other musicians, for private events, performing jazz ranging from the 20s through the 50s. He plays bass as well as regular guitar. He volunteers each year to play in the pit orchestra for Lansing High School musicals, the latest being Seussical the Musical last month. "That was fun," he says. "I consider that community service. I enjoy it a lot." He recently transcribed and performed a song for the Lansing Elementary School choir. Keefe says he likes all the styles he plays, and spends a lot of time practicing and learning new pieces. "For a solo gig it's all jazz," he says. "For the rock & roll stuff anything from the '50s through the '80s. "The current stuff is not that interesting," he says, "because the guitar is not as prominent as it was in the '60s and '70s." When Keefe is not performing he is teaching. He splits his time between his own home studio and Ithaca Guitar Works, teaching between 32 to 40 private guitar students depending on the time of year. "Some Cornell students take lessons for credit from me," he says. "I've got a lot of Lansing students, too, about 16 from 3rd grade to seniors in High School." "I enjoy teaching in my own studio, because I have a library of books about groups. I listen to anything from the Beach Boys to Frank Zappa. It's almost A to Z," he smiles, "I've got B to Z." He keeps an extensive CD collection that he uses when a student wants to hear how something is performed. He adds that guitar players should also know how to fix their amplifiers. In fact, he built two of his own amps himself. His youngest student is a 3rd grader. "She had a lot of experience playing Suzuki violin so she picked up the guitar really quickly." His oldest student is a Cornell professor, about 55 years old. His all-time oldest student was 74 years old. "He was good," Keefe says. Keefe teaches all styles of guitar. "I teach everything from classical to folk to finger-picking to jazz to rock to blues -- everything," he says. "You have to if you're a guitar teacher." Students range in experience from beginners to advanced players. Students tend to study with him for an average of three years. Some go into the field. One, who studied with Keefe for six years became a performance major when he went to college. Others have been accepted to music schools. "It's fun to teach," he says. "It's indescribable. I never had a bad day teaching, and I've been doing this for over 30 years." He lives in Lansing with his wife Janet and their two children, Martin (13) and Allison (4). He says both children are very musical. Martin plays drums. He still loves the music he grew up performing, too. "A lot of the kids that come up through the ranks playing guitar listen to the music their parents listen to, which is the stuff I grew up with in the '60s and '70s," he says. "I think that's probably the first generation that's happened with. We didn't listen to our parent's music when we were kids. So that speaks really highly of the music that came out of that period. It was classic rock and it's still classic rock."